We design and develop fully customized websites using the newest advances our industry has to offer. We focus on identifying goals that will help our clients achieve success and then gear everything about the project toward ensuring that those goals are not only met but exceeded. Whatever your objectives are -- increased sales, streamlined business processes, a more clearly communicated message, or anything else you can imagine -- we can work with you to craft a new website that helps you reach those objectives. Originally formed in 1999, EarthSky Studios, Inc. has been designing and building custom websites and web applications for businesses and organizations of all shapes and sizes including manufacturers, retailers, marketing firms, legal & financial companies, government agencies, and creative services. Our location allows us to serve the entire Philadelphia area including Malvern, PA (where we are headquartered), Downingtown, West Chester, Chester County and the other Philadelphia-area counties. Beyond Pennsylvania, we have clients in New Jersey, Delaware, Maryland and New York and across the country. 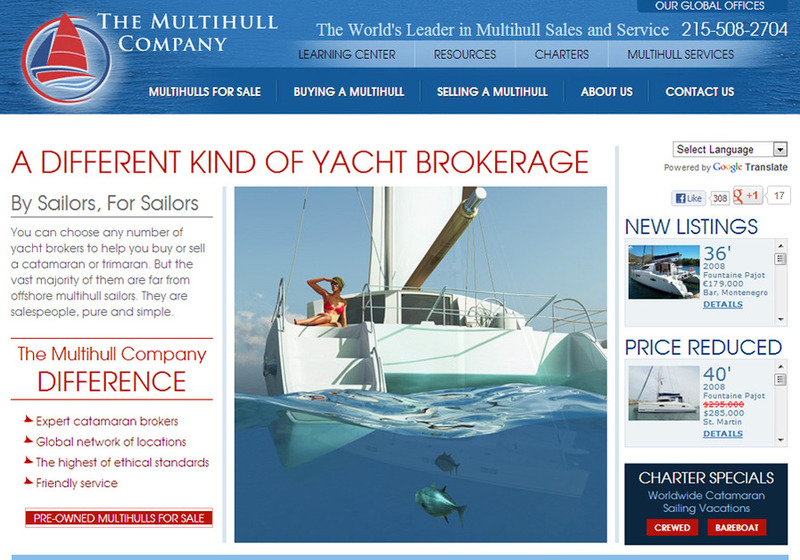 This is a screenshot from a website we recently designed and developed for The Multihull Company in Philadelphia.